This fresh mango salsa recipe produces a salsa that is outstanding. 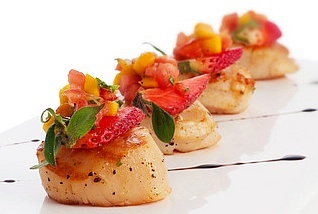 Serve with grilled fish, chicken or homemade tortillas. I love spicy grilled fish or chicken and the refreshing taste of fresh mango is wonderful. This is how you would cut a mango to get the beautiful fruit out. If it is going in a salsa, the cutting is done. How? Just cut the mango in half and make vertical cuts from one end to the other. Then make horizontal cuts from one end to the other. Just scoop the pieces out with a spoon. It's easy, isn't it? 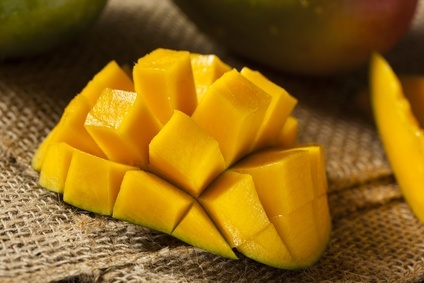 Finding a ripe mango has more to do with your hands then looking at the color. Lightly squeeze the mango and if it has a little give it is ripe. If it is hard, move on to the next mango. The red color has nothing to do with the ripeness as some people think. Another tip is if the cut end smells fruity, it is ripe. Mix all ingredients in a bowl, cover and chill for several hours before using. In a medium bowl, combine the mango, avocado, tomatoes, jalapeno, cilantro, and garlic. Stir in the salt, lime juice, red onion, and olive oil. To blend the flavors, refrigerate for about 30 minutes before serving.